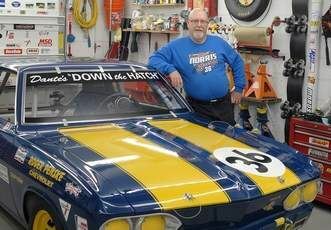 In the workshop of his Hurricane residence, Rick Norris stands next to his 1965 Sunoco Corvair Yenko Stinger clone that was a project car when he first purchased it in 2005. He will race it at the HST Walter Mitty Challenge this weekend in Braselton, Ga.
To say that Rick Norris has a passion for fixing, building and driving Corvairs is like saying that fish like to swim or ancient Vikings liked to plunder and pillage. For nearly 50 years, Norris has followed his passion in one form or another and it has taken him on an enjoyable ride. He began collecting Corvairs in the mid-1960s, built his own workshop/garage in the basement of his Hurricane residence and was the first president of CORSA, the Corvair Society of America, attending their first national convention in Chicago in 1971. He currently serves as CORSA’s historian. Norris, however, always had one dream when it came to his love of cars and Corvairs in particular: racing them. “I always wanted to be a race car driver, but I always had kids and responsibilities, so I couldn’t do it,” he explained. “So, I had to live vicariously through the people who were racing.” In July of 2006, already in his early 60s, Norris saw his youth’s dreams fulfilled. He began participating in vintage car racing for the first time. He built, basically from scratch, a 1965 Sunoco Corvair Yenko Stinger clone made as an exact replica of the Trans-Am owned by Roger Penske and driven by Mark Donahue, one of his favorite owner-driver duos, and hit the track at the Nelson Ledges Raceway in Garrettsville, Ohio. Since then, he as competed in numerous races throughout the eastern United States and will take part in his sixth HSR Walter Mitty Challenge this weekend at the Road Atlanta course in Braselton, Ga.
After high school, another love of his during his early days led him to join the Air Force, where he would spend four years of active service and three with the Air National Guard in Charleston. “I’ve always liked airplanes, so it was a no-brainer to me,” he said, as his father had also served in the Air Force and, in World War II, the Army Air Corps. He would end up in Vietnam, stationed at the Bein Hoa Air Base as a bomb loader. “I was going to make the military a career, but Vietnam changed my mind. Plus, I had young kids at home. At that time, I was in a critical career field with four years of experience at it. I knew if I signed up, I’d be back in Vietnam.” It was during his time in the Air Force that he came into ownership of his first Corvair. The Corvair, a compact car produced throughout the 1960s, was built by the Chevrolet division of General Motors. “Corvair was originally marked as an economy car and later on an American version of a poor man’s Porsche,” Norris said. “It shares some of the handling characteristics and design style of a Porsche, but it’s all GM.” It was the success of the Ford Mustang that would lead to GM to end production of the Corvair in 1969 and focus on the Camaro. When Rick hits the track, the results of the race are not as important as the race itself and the joy it brings. “My idea of winning is that the car went back on the trailer the same way it came off,” said Rick, who became a pipe designer after his military service and still does some contract work from time to time. The car was purchased in Arizona in 2005. “It’s the only Corvair I had with no rust. It had a bullet hole, but no rust.” He keeps his race car in pristine shape, one that could easily be found on the showroom floor as easily as on the asphalt track. “It was a project,” he said. “The motor was in parts. I had to do everything to it. I stripped it clear to the bone.” The only thing he didn’t do was put in the roll cage and paint job itself, even though he knew what he wanted the car to look like, an exact replica, a tribute car, of that driven by his idol. He also owns a 1967 Corvair Monza Convertible that he has driven in numerous parades since 2007.